Tehran is the biggest and most populous city in Iran. According to UN Data, Tehran had a population of 8.4 million in 2015. However, in a study we conducted two years ago, Tehran was categorised as a megacity, which according to the UN should have a population of at least 10 million. Like many other world megacities, where the daytime population is much higher than it is at night, the daylight population of Tehran can reach up to 12 million as commuters arrive from the heavily urbanised wider region. Tehran’s metropolitan has been growing at a rate of about 1% per year over the past two decades, which has also brought high pressures from the rapidly urbanising population. Growing transport demand comes hand in hand with extreme traffic congestion and consequently high levels of air pollution, which cause a number of serious health problems. This problem is of great significance for Tehran, considering the fact that the city is surrounded by mountains that trap the pollution over the city. To improve the quality of life, the authorities of Tehran examined and implemented a number of sustainable transportation solutions. In 1999, Tehran’s metro began the operation of its first line – Iran’s first metro system – to serve as the backbone of public transport in Tehran. Currently the metro network consists of five lines with a total of approximately 200 kilometres and 100 stations that serve more than 2 million passengers a day and handle 815 million trips a year (cited from various sources). The metro network is complemented by a Bus Rapid Transit (BRT) system. The first BRT line commenced operation in 2007 and now, a decade later, the BRT network has seven lines. Some 80% of the network has dedicated right of way and transports four million passengers per day. Private buses and taxis are operated mainly by the private sector to fill any service gaps. When we talk about taxis in Tehran, the ones with yellow or green colours, we’re not talking about taxis that take you straight to your destination. These taxis operate along the main roads, and you share them with other passengers. It’s kind of a shared taxi or carpool concept. You might have to change taxis in order to reach the closest main road to your destination. 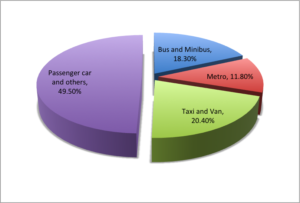 In sum, taxis in Tehran are a paratransit service and their contribution is significant (see the following graph). Tehran’s modes share in 2013 (source: Tehran Transportation Master Plan, 2013). Apart from strengthening public transport policy, Tehran has also been implementing demand management measures such as an annual fee for cars to enter the inner central business district and the enforcement of even and odd number plates. In 2011, Tehran was nominated for the Sustainable Transport Award by the Institute for Transportation & Development Policy. In 2013, Tehran’s Transportation Master Plan was revised from a car-oriented vision toward a more people-oriented one by focussing investment on public transport, bicycle paths and walkways. More than 368 kilometres of dedicated cycling routes have been put in place. Considering the significant number of taxis and the absence of a unified system, the revised master plan also aims to integrate taxis into the transportation system. The master plan also sets a target to increase the share of trips on public transport to 75%. When it comes to sustainable transport solutions, Tehran seems to be further ahead than other megacities in developing countries. Jakarta, for example, is still at the preparation stage of implementing the odd-even license-plate system. In this city, non-motorised transport (NMT) policy is also absent. The same goes for Cairo, where there is little if no specific provision for pedestrians and cyclists, despite its high levels of pedestrian traffic (as concluded in this study).